This expanded anniversary audio edition of the perennially bestselling 7 Habits of Highly Effective People includes a new foreword read by Jim Collins, bestselling author ofGood to Great; the final interview with Stephen Covey, read by his son, Sean; and a tribute to Stephen Covey, read by his daughter, Cynthia. Twenty-five years, 20 million copies solda true book publishing legend! In Stephen R. Coveys seminal workThe 7 Habits of Highly Effective People, a holistic, integrated, principle-centered approach revolutionized the way people solve personal and professional problems and go on to lead extraordinary lives. With penetrating insights and pointed anecdotes, Covey revealed a step-by-step pathway for living with fairness, integrity, service, and human dignityprinciples that give us the security to adapt to change, and the wisdom and power to take advantage of the opportunities that change creates. 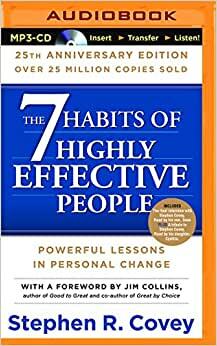 The 7 HabitsBe Proactive; Begin with the End in Mind; Put First Things First; Think Win/Win; Seek First to Understand, Then to Be Understood; Synergize; and Sharpen the Saware so famous and have been integrated into everyday thinking by millions and millions of people for one reason: They work. Covey offers life-changing advice on everything from leadership, time management, and teamwork to success, love, and taking control of your life. In taking his advice, youll discover how the priceless wisdom of the 7 Habits still holds true after twenty-five years. Start reading The 7 Habits of Highly Effective People on your Kindle in under a minute. Recognized as one of Time magazine's 25 most influential Americans, Stephen R. Covey was one of the world's foremost leadership authorities, organizational experts, and thought leaders. Covey was the author of acclaimed books, including the international bestseller, The 7 Habits of Highly Effective People, which has sold more than 25 million copies in 40 languages throughout the world. Other bestsellers authored by Covey include First Things First, Principle-Centered Leadership, The 7 Habits of Highly Effective Families, and The 8th Habit: From Effectiveness to Greatness. Find Your Happy Daily Mantras: 365 Days of Motivation for a Happy, Peaceful and Fulfilling Life. This is one of those classics, often referred to but in my case not as widely read. I bought it not because I was after a PowerBook to change my life but actually wanted to see what everyone goes on about and it was on kindle special list for the day so was relatively cheap & could justify it if I felt it was a lot of American hogwash. Surprisingly, it was really good, and while it Is the quintessential "life improvement" book, it wasn't preachy and difficult to read with a lot of "consultant jargon". Based on Covey's decades long study of self-improvement and human character, this book is a straight forward & effective tool for getting your mind to set & achieve goals. A lot of these concepts we already know however reading them in this order with the relevant explanations helps to cement thoughts into concrete plans. The book was very well written, I would absolutely recommend it, it’s applicable to all aspects in life. 5.0 out of 5 starsEssential Covey. For me, the 7 Habits are the essences but not the whole story. Each essence has its own implications if you're willing to consider them. Of course, considering without applying has limited value, and it's one of the easy-to-miss features of Covey's writing that he asks you to get up and do more than nod your head in agreement. Covey's writing endures in part because he doesn't try to make you an infant who is incapable of doing things for yourself, like so many self improvement books do nowadays. Covey reminds me to think deeply and authentically about what I want, because one day I'll be living with the consequences of it. Needs to be read at least annually, sometimes more often, whenever you think that you know what you are doing. I've come across few non fiction books that are hard to put down, but this is one. I have read many self help books, but few as insightful and helpful as this. The many examples help illustrate how a person might apply the principles in their own life. I like the structure that this book brings to your life. One of the favourite quotes: "Peace of mind comes when your life is in harmony with true principles and values and in no other way." The principles explored in this book, are timely and applicable for any stage of life. Highly recommend this book.